I know I learned a lot from this post in the last week. Outstanding post, and the photos really help make your points. Thanks! It is indeed rare for a 100+ yr old coin to still be white. Here is an example of an original Shield nickel that is still blast white with a thick, original skin. Granted, it is a different alloy and is less prone to toning than silver but it still serves as an example of old, white originality. p.s. Dipped, AT or not, I still love that Capped Bust Quarter! I had asked the moderators to change the web address for each of my images since I have reconfigured my web hosting service and this required one of them to edit my initial post. Please note that none of the images or text have been modified, simply the code behind them. Great post! I think it just doubled my numismatic knowledge! NGC just returned a 1798 $ from IGC with a white lable . The label was marked CLEANING. NOT Improperly cleaned or whizzed .. just Cleaning . What does this mean ? AND how can I get this coin graded (Crossover ). You should be able to get a response from NGC by posting here. That link should put you on the "Ask NGC" forum. I just got a 1798 dollar back (it was slabbed by ICG). I wanted it regraded (crossover) . It came back with a white lable on : the box CLEANING was checked. Without pictures, it is hard to say. I have had one coin come back "cleaned" for a small spot on the obverse which had been removed before I bought the coin and I missed it because it was very small. Really enjoyed your post. Thanks for sharing. In regards to the 1939 WQ the color seems to be a blue green image. Is this a true representation of this coin or is it just a color corrected image? I see what you mean regarding the surface toward the rim being different than toward the center. As for the [skin] of a coin is this a metallurgic term refering the orginal surface characteristic flow lines produced under pressure? Or perhaps its the build up of oxidation products such as toning due to the formation of silver/copper sulfide would be considered as patina layer? Not sure coinage metals have 'skin' that can peeled or removed as that of an orange or an animals hide in a continuous layer. A coins top exposed surface can exhibit different textures but as skin? For example, a newly minted coin can exhibit a cartwheel, prooflike, or deep mirror prooflike reflective surface and is due to the reflection or refraction of light off of the coins surface. 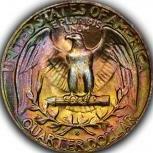 As for the toned coin light is absorbed giving it that dull brown or black color. It means that the grading service does not handle dirty coins and before they will grade it you must have it cleaned! This is the same for 'no cause altered surface'. In order for them to BB it 'Altered Surface' they want you to alter the surface and tell them how you did it. Then, they will process it and accept two submission payments from you instead of one.